Reservation Genie lowers the cost of online reservations with transparent tools that help you be creative with your marketing. Cut Reservation System Invoices by up to 90%! Schedule a demo to learn how Reservation Genie helps you stop paying unnecessary cover fees. 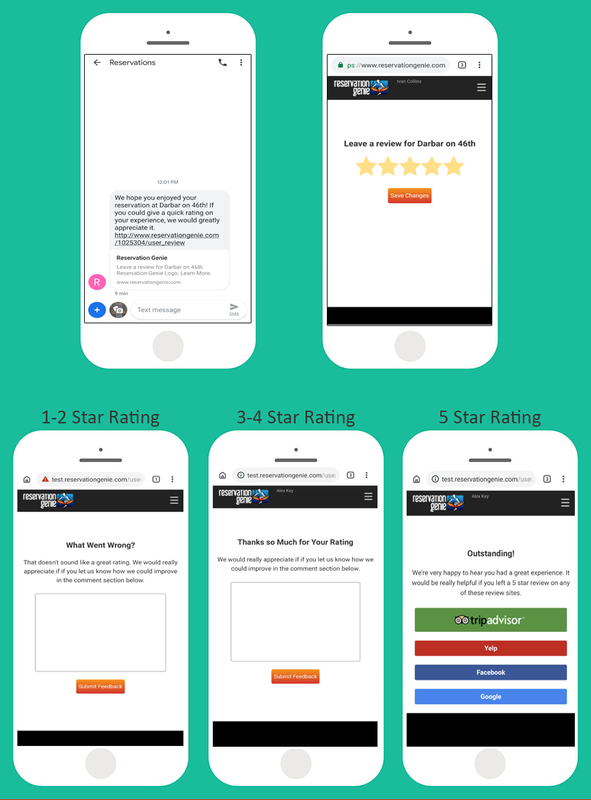 We rolled out a new tool called Review Booster to help clients boost their ratings on popular review sites like Trip Advisor, Yelp, Google, and Facebook. For our restaurant clients that use Reservation Genie alongside Open Table, this is a great benefit above and beyond the cost savings and extra marketing. Open Table steers their customers to write reviews on their website. This makes it very difficult to encourage reviews on the other heavyweight review sites in an easy and automated way. But with Review Booster that has changed. The idea behind Review Booster is pretty simple. Every customer is sent a text message the day after their reservation asking them to rate their experience with 1 to 5 stars. From there we encourage customers with 5 star experiences to write a review and others to offer comments on how you can improve your business. 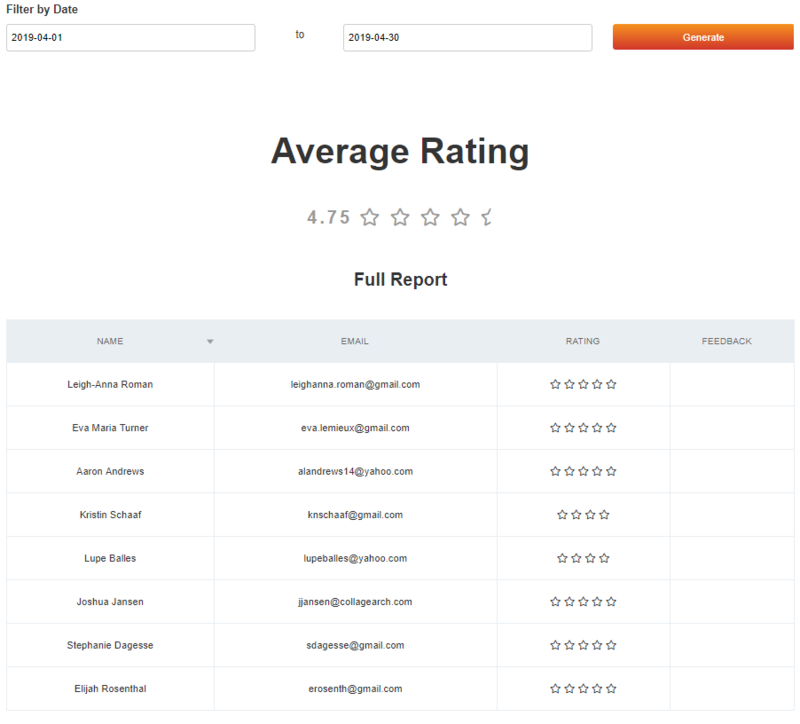 You can monitor customer ratings and read comments by visiting Reporting > Ratings while logged into Reservation Genie. The idea is to let customers vent internally if they had anything less than a 5 star experience so they don’t give a weak rating on review sites. Below you can see screen shots of the different options customers experience. If your scores are high on one review site, but low on another you can include links only on the sites with low ratings that you hope to improve and thus guide happy customers to give you high ratings on sites where you need the ratings the most. For example, if you have 4.5 stars on Trip Advisor, 4.7 on Google, 3.7 on Yelp and 3.2 on Facebook, you can remove the links to Trip Advisor and Google so customers are encouraged to focus Yelp and Facebook. For Yelp and Trip Advisor, you simply find your profile on those sites and then click on write review. Cut and paste the resulting URL into the proper field in Reservation Genie > Marketing > Review Booster. Make sure it’s the one where customers can select an actual star rating and write a description. Google uses a Google Places ID code that you use with the link below to access your review process. To build the link first search for your business here and make sure you enter the city to narrow the results. When you see your business select it and you will see a Place ID code. Cut and paste that code into the link below replacing the portion after the = sign. Then cut and paste that entire link into the field for Google on Reservation Genie. When you’re done, hit save and scroll down and you’ll see links to test the implementation for all the review sites. Check those to make sure they open properly. We added a report to your reporting section that shows all the ratings you received over time (see below). You can change the date ranges to get an average and measure if your customers are giving you higher scores this month than last month to know if things are getting better. You can use this feedback to monitor new mangers and determine if ideas for improvement are working over time. We may create options to respond to negative reviews so you can offer to make up the for negative experience if clients are interested those tools. If so, let us know. As always, do not hesitate to get in touch if you have questions or need help implementing Review Booster. Take the Tour → Watch a 2 minute video demo of Reservation Genie and learn about key features. ReservationGenie.com © 2007-2019 All rights reserved.